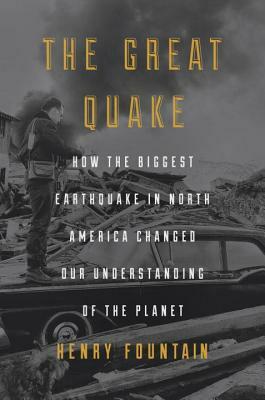 In the bestselling tradition of Erik Larson’s Isaac’s Storm, The Great Quake is a riveting narrative about the biggest earthquake in North American recorded history -- the 1964 Alaska earthquake that demolished the city of Valdez and swept away the island village of Chenega -- and the geologist who hunted for clues to explain how and why it took place. At 5:36 p.m. on March 27, 1964, a magnitude 9.2. earthquake – the second most powerful in world history – struck the young state of Alaska. The violent shaking, followed by massive tsunamis, devastated the southern half of the state and killed more than 130 people. A day later, George Plafker, a geologist with the U.S. Geological Survey, arrived to investigate. His fascinating scientific detective work in the months that followed helped confirm the then-controversial theory of plate tectonics. In a compelling tale about the almost unimaginable brute force of nature, New York Times science journalist Henry Fountain combines history and science to bring the quake and its aftermath to life in vivid detail. With deep, on-the-ground reporting from Alaska, often in the company of George Plafker, Fountain shows how the earthquake left its mark on the land and its people -- and on science. HENRY FOUNTAIN has been a reporter and editor at the New York Times for two decades, writing about science for most of that time. From 1999 to 2009 he wrote "Observatory," a weekly column in the Science Times section. He was an editor on the national news desk and the Sunday Review and was one of the first editors of Circuits, the Times' pioneering technology section. Prior to coming to the Times, Fountain worked at the International Herald Tribune in Paris, New York Newsday, and the Bridgeport Post in Connecticut. He is a graduate of Yale University, where he majored in architecture. He and his family live just outside of New York City. Learn more at henry-fountain.com. "The Great Quake is rich with...revelations; and I felt grateful, even giddy, as I read them. Fountain's book is like a gift box: Open the lid to peek at the treasures of the Earth. I could geek out on such details for a month." "As elegant as a Beethoven symphony...journalist Henry Fountain provides us with a forthright and timely reminder of the startling historical consequences of North America's largest known earthquake." "The Great Quake is an elegant showcase of how the progressive work of numerous scientists over time…can be pieced together into an idea that reshapes how we see and understand the planet." "Mr. Fountain weaves a compelling scientific detective story." "'The Great Quake' explains how one of North America's worst recent natural disasters led to a fascinating insight. Henry Fountain offers a gripping tale of loss, heroism, and, ultimately, discovery." "Henry Fountain knows earthquakes, and he knows how to spin a yarn. 'The Great Quake' is the fascinating result. It takes meticulous research and real narrative skill to tell a story that moves this fast yet still feels so complete. The book shines on two levels: as a portrait of two quirky frontier communities before, during and after a stunning disaster, and as the story of an unpretentious geologist whose brilliant analysis of the great quake's causes provided crucial backing for one of the biggest ideas in all of science." "For five terrifying minutes in 1964, the earth shook beneath Anchorage, Alaska. It devastated the city, and towns and villages throughout the state. In this fast-paced, engaging account of that disaster, Henry Fountain tells us what it was like to be there. His interviews with fortunate survivors bear witness to the pluck and determination of the human spirit--and reveals the better side of our natures in times of crisis. Read this book to better understand nature's power--and our human resilience. Fountain's riveting, 'you were there' account pulls you in, and keeps you turning the pages to find out who survived--and how." --Virginia Morell, author of Animal Wise, a NY Times bestseller.